Note: there’s going to be an exciting announcement within the next little while on a new development regarding the Reagent Guide…more details to come soon! Similar or equivalent to: Iron chloride (FeCl3) is another reagent which performs many of the same reactions as AlCl3. In addition AlCl3 has essentially the same mode of action as AlBr3 and FeBr3. 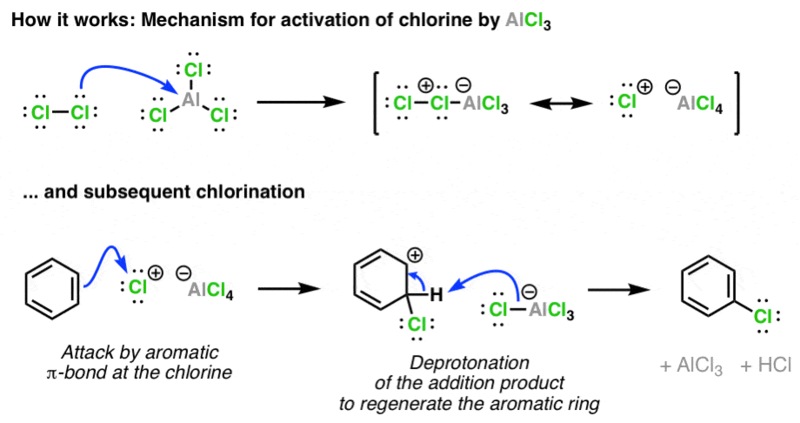 AlCl3 promotes the chlorination of aromatic molecules such as benzene, when chlorine (Cl2) is added. The AlCl3 is regenerated, and HCl is a byproduct. The Friedel-Crafts reaction is also promoted by AlCl3. In Friedel-Crafts acylation, the product is an aromatic ketone, and the byproduct is HCl. 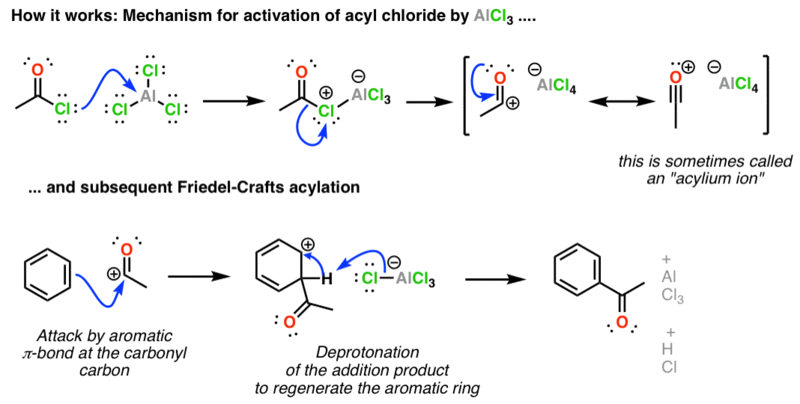 The Friedel-Crafts alkylation reaction is also promoted by AlCl3. Since AlCl3 will lead to the formation of a carbocation, one thing to watch out for in these cases is the possibility for rearrangement to more substituted carbocations. Finally, AlCl3 will react with alcohols to make aluminum alkoxides. The aluminum alkoxides, once formed, will catalyze the Meerwein-Ponndorf-Verley reduction of ketones to give alcohols. Interestingly, the reductant in this case is not the aluminum, but the alcohol from the aluminum alkoxide. In the process, this alcohol is oxidized. AlCl3 (and other Lewis acids like it) will coordinate to halogens, and facilitate the breaking of these bonds. In doing so, it increases the electrophilicity of its binding partner, making it much more reactive. The aromatic group then attacks the resulting strong electrophile, leading to what is often called the Wheland intermediate. (or “arenium ion”). Finally, this loses a proton to regenerate the aromatic. You might get some deja vu looking at the reactions of AlCl3, FeCl3, AlBr3, and FeBr3. They all behave essentially identically in these types of reactions. One final question: why do you think AlCl3 or FeCl3 might be preferred for chlorination reactions and AlBr3 or FeBr3 for bromination reactions? Why not use AlCl3 for bromination reactions? P.S. You can read about the chemistry of AlCl3 and more than 80 other reagents in undergraduate organic chemistry in the “Organic Chemistry Reagent Guide”, available here as a downloadable PDF. AlCl3 is one of my favorite Lewis acids. The MPV reduction is a really interesting reaction—it’s fallen by the wayside because it’s thermodynamically controlled and poor yields are common, but you see hydride shifts like the key step of the MPV reaction coming back in a big way these days! Case in point—the opposite reaction, the Oppenauer oxidation, is named too! I love that reaction too! Just love the fact that alcohols can act as reductants, and aldehydes/ketones can act as oxidants. Hydride transfers are a pet interest of mine. Actually, the yields in the MPV reaction aren’t always too bad, and you can force it towards product just by using a lot of isopropanol, which is nice and cheap. It’s also great on a large scale for that reason – R. B. Woodward used it as the second step in his famous reserpine synthesis (http://www.synarchive.com/syn/21; no yields unfortunately) on – if I recall correctly – 300g batches. As an aside, they also do that Diels-Alder in the first step on 2kg scale, in something like 3 gallons of benzene (the volume is given in gallons, but I forget the exact number). Those were the days. FYI: Images are missing on Reagent Friday: Aluminum Chloride (AlCl3) post. Fecl3 can work same as AlCl3? Absolutely. So can many other Lewis acids. It has to be at least one equivalent. what will happen if hydrated aluminium chloride is used in friedel crafts reaction? I don’t believe the hydrate will perform the Friedel Crafts. you have to use anhydrous AlCl3. I understand that AlCl3/FeCl3 acts as a halogen carrier during chlorination of an arene. But why is it that the AlCl3/FeCl3 has to be ANHYDROUS? What happens if it is not anhydrous? AlCl3 reacts with water to give aluminium hydroxide and HCl. The Lewis acidity of AlCl3 and FeCl3 is greatly attenuated if water is present. Hmm I though AlCl3 reacts with water to give an Octahedral complex( with H2O as ligands)??? So even though FeBr3 would be preferred for a bromination reaction, can AlCl3 still be used as the acid catalyst? Why is iron(III) chloride attractive as an alternative to the traditional AlCl3 as a catalyst for Friedel Crafts reactions? How do we determine if BF3 can replace AlCl3 in these reactions? There’s nothing wrong with ScCl3, that can be used as well. 1) Is FeCl3 a suitable catalyst for electrophilic substitution with iodine monochloride? 2) Can FeBr3 be used as well? 3) Which one of these is a stronger Lewis acid? I read somewhere that the substrate does not undergo rearrangement in the presence of FeCl3. Phenol is a very reactive aromatic. The trick is to get it to stop at doing a single alkylation. Often, the way to do it is to protect the alcohol as an ester, do the FC alkylation, and then cleave the ester to give you back the alcohol. The picture displaying the scheme for the FC acylation is an alkylation. It looks like you had some pictures disappear from this post? The older must have been overwritten with the alkylation scheme. Shoot, you are right. Will fix. Thanks! LiAlH4+AlCl3 with epoxide reaction can u explain me sir? If there is a carboxylic group attached to benzene already, will it react with anhydrous AlCl3? Yes, it’s a Lewis acid, and will coordinate to the carboxylic acid.